With the success of Twilight and True Blood why not add another book into the entertainment mix? 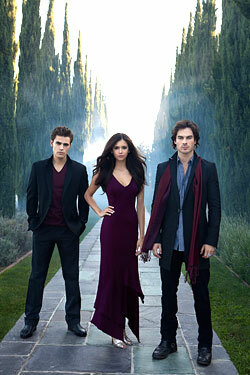 Cue Vampire Diaries, the young adult series written by author L. J. Smith, now a television show. Vampire Diaries is a very successful book series about a human girl named Elena who is gorgeous, perfect and can have any guy she wants. Then there is Stefan, the dark, brooding vampire with the horrible past who is the only one that appears to be able to resist Elena. And finally we have Stefanâs brother Damon, the wicked vampire driven by revenge for Stefan and determined to have Elena all to himself. Sounds like the perfect storyline for a drama show. Right? Thatâs what producer Kevin Williamson thought as well. Although a young adult series about vampires, Kevin Williamson assures us that this is not a high school only show and that its also not about vampiresâ¦.yeaaa. Apparently the show just has vampires in it but isnât actually about vampires but rather about the town they all live in. As he said at the CW panelâ¦ âThere’s this darkness that lies underneath this town … it’s not a high-school show, it’s more a story of a small town.” He also says “It’s not Twilight, it’s not True Blood.â Clearly. Although when it comes to Twilight, they both have the girl being fought over by two emo boys. Uh huh. From what I have seen so far it isnât something new and special. You have the hot girl who has suffered a great loss and then comes in the hot boy who makes her feel good again. A classic story plot. Obviously I am a bit skeptical but not enough so that I wont give the show a shot. I mean, a teenage vampire drama couldnât hurtâ¦. too badâ¦ right? Plus side: the cast is hot. Well, I will let you decide for yourselves, check out this clip from ComicCon â09 featuring producers and cast discussing the new show. I Loved this series..i thought the book was just amazingly!!!! I even read night people and was a little disappointing with some of the stories but it was still well written, i just love how the author can take real life problems with teen’s and add hot vampires in with it. I think the vampires just make the stories just soo much better. this show is awesome and is almost nothing about the book and its not right tht u judge the show before u even watch it. This post was written before the show even came out. I love the show now. Beats Buffy by a long shot. I never really saw the appeal the Buffy series had. Angel was the only interesting part of the whole thing, in my opinion. i like buffy and twilight… but vampire diares is a lot more awesome! i also love the lost boys! Vampire Diaries actually isn’t that much of a vampire series. Yes, it has vampires in it, and yes, they are a big thing in it because, well, half the main characters are vampires. However, it also has demons and ghosts, werewolves and kitsune (werefoxes). It truly is about the town rather than the highschool, and although there is the typical romance, it shouldn’t be surprising. It’s what lifts the main character off of the real world and into this fantasy world full of creatures waiting to eat you alive. Besides, what book or show or movie HASN’T had a romance in it? That’s in general, I mean. I’m sure a few stray movies and books don’t have romances, but the majority DO have them. ive read . and re-read the first two . i still cant get anough . im still saving for the next 2 .